If you could design your dream car, what would it look like? 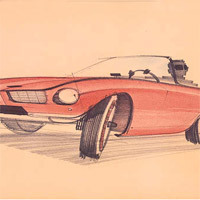 Industrial designer Raymond Loewy made his dream come true on March 22, 1961, when he designed a sleek, futuristic sports car called the Avanti. Sherwood Egbert, president of the ailing Studebaker Corporation, asked Loewy to design a car bold enough to capture people's imagination and boost the company's sagging sales. Did the plan work?